HMAS Waterhen was first commissioned in 1962, as the parent establishment for Australia's Mine Countermeasures (MCM) Force, Clearance Diving Team One and a variety of Support Craft. For many years, the base supported the Australian Mine Warfare and Patrol Boat Forces, serving as the home port for mine countermeasures vessels and both the Attack and the Fremantle Class patrol boats. In the early 1990s Waterhen underwent an extensive redevelopment and modernisation program in which all facilities were rebuilt. This project delivered an establishment designed to fare well into the future. The handover ceremony for the completion of the Modernisation Program was held 20 February 1997. Waterhen is the Royal Australian Navy's lead establishment for Mine Warfare. A shore establishment occupied by many professional sailors and home to some of the most advanced Mine Countermeasure equipment and technology, all contributing to the Navy's mission. Waterhen is the second commissioned unit to carry the name. The first, the 'Chook', as she was affectionately known by her ship's company, was one of four 'V' Class Destroyers built in England in 1918. Transferred to the RAN in 1933 she was in and out of reserve before being re-commissioned for war in September 1939. Waterhen (I), with her sister ships Stuart (I), Vendetta (I), Vampire (I) and Voyager (I) became famous as the 'Scrap Iron Flotilla' in the Mediterranean. She was lost at sea 30 June 1941. The original Waterhen (I) was one of the 'V' Class Destroyers (Waterhen (I), Vampire (I), Vendetta (I) and Voyager (I)) loaned by the Admiralty to the Royal Australian Navy in 1933 as a replacement for the 'S' Class Destroyers Stalwart, Success, Swordsman, Tasmania and Tattoo). The destroyers were commissioned into the RAN at Portsmouth , England on 11 October 1933 to form the Destroyer Flotilla, later to become famous as the 'Scrap Iron Flotilla'. Waterhen (I) spent the following six years either serving on the Australian Station or in Reserve. Following the outbreak of war, she was recommissioned on 1 September 1939, and her first wartime duties were anti-submarine patrols based out of Sydney , alternating with HMA ships Stuart (I) and Vendetta (I). From 2 January 1940 Waterhen (I), as part of the Australian Destroyer Flotilla, served with distinction in the Mediterranean . On 28 June 1941 she left Alexandria for Tobruk with HMS Defender on what was to be her last run. The following evening at 1945, both ships were attacked by dive-bombers and Waterhen (I) was holed and immobilised, incredibly there were no casualties. She was taken in tow by HMS Defender, however it soon became apparent that she could not be saved. At 01:50 on 30 June 1941 the 'Chook', as she was affectionately known to her crew, sank and became the first RAN ship to be lost by enemy action during World War II. The present HMAS Waterhen is located on the shores of Sydney Harbour at Waverton on a land area that was originally granted to Edward Wollstonecraft and passed to his business partner Alexander Berry in 1832. Today it owes its geography to the need in the 1930s for a graving dock facility for the RAN. The cliff which forms the 'back wall' is a result of quarrying operations which saw stone removed from the Waverton site to Potts Point to form the Captain Cook Dock and the land bridge between Potts Point and Garden Island, which was actually a true island at that time. With the advent of World War II, the site was filled and a number of 'temporary' fibro buildings were constructed. The site was utilised as a Boom Defence Depot where they stored the 'booms' (steel nets for underwater use to stop enemy submarines from entering the Harbour). It was a joint RAN/USN facility from 15 March 1943 to 30 June 1943, then was under RAN control from 1 July 1943. After World War II the site reverted to a storage depot until HMAS Waterhen was commissioned on 5 December 1962 to serve as a support base for the six 'Ton Class' Mine Sweepers, HMA Ships Teal, Ibis, Snipe, Gull, Hawk and Curlew, acquired from the Royal Navy in the 1960s. This was the first small ship base of this nature and was also home to the Mobile Clearance Diving Team. With a complement of 85 Officers and Sailors, the base had no accommodation, so the River class frigate HMAS Culgoa was relocated to the northern wharf and put into use as a barracks ship. In March 1969 HMAS Waterhen became the first base for the first fully Australian designed and built Naval craft, the 'Attack Class' Patrol Boats and the Commanding Officer HMAS Waterhen also became Commander Australian Mine Warfare and Patrol Boat Forces (COMAUSMINPAB). The Attack Class Patrol Boats were superseded by the 'Fremantle Class' Patrol Boats to HMAS Cairns and Darwin Naval Base. The role of COMAUSMINPAB was divided into Commander Australian Patrol Boat Force (COMAUSPABFOR) who relocated to HMAS Cairns, and Commander Australian Warfare Force (COMAUSMINFOR) who remained as Commanding Officer HMAS Waterhen. COMAUSMINFOR was subsequently changed to Commander Australian Mine Warfare and Clearance Diving Forces (COMAUSMINDIVFOR), a more complete reflection of the composition of the Australian Mine Countermeasures Force. In early 2000, following a broad restructure of the Navy, this title developed into Commander Australian Navy Mine Warfare and Clearance Diving Group (COMAUSNAVMCDGRP). In addition to the formation of COMAUSNAVMCDGRP, the RAN's Mine Warfare and Clearance Diving capabilities were upgraded to include the Mine Warfare Systems Centre and six 'Huon Class' Minehunters. It soon became apparent that the 50 year old temporary fibro buildings and two existing wharves at could not support the Mine Countermeasures Forces of the future. 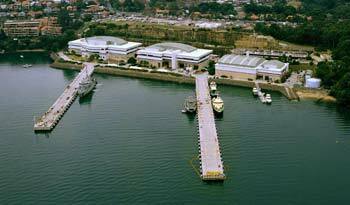 After 30 years HMAS Waterhen was about to have a radical facelift. The Modernisation Project commenced in December 1994 with the demolition of buildings at the northern end of the base and in the months to follow the entire base was levelled and the existing wharves removed. Throughout the modernisation, staff managed to maintain an operational base. The core administrative staff worked out of various temporary structures, which had a somewhat shorter lifespan than HMAS Waterhen's original temporary buildings. Some lodger units were also temporarily relocated to other establishments, the Project was completed in December 1996 which was eight months ahead of schedule and at a total cost of $70 million. The new Waterhen complex comprises of three main buildings, two new wharves, a small boat jetty and boat ramp, a four level car park (196 car spaces), an oil fuel installation (OFI), a gatehouse and a magazine. The two main buildings each consist of three levels and house Waterhen and COMAUSNAVMCDGRP support staff, the new Mine Warfare Systems Centre, AUSCDT ONE, and the MWF. The third building houses Fima Waterhen. To appreciate the magnitude of the transformation of Waterhen consider that Building One alone contains more floor space than the entire Waterhen pre-modernisation. In recent years, HMAS Waterhen has been home to HMA Ships Rushcutter and Shoalwater, the 'Bay Class' Australian designed mine hunting catamarans which replaced the Ton class mine countermeasures vessels. On 14 August 2001, these vessels were decommissioned and on 11 September 2001, they finally left the wharves of HMAS Waterhen for Spectacle Island.